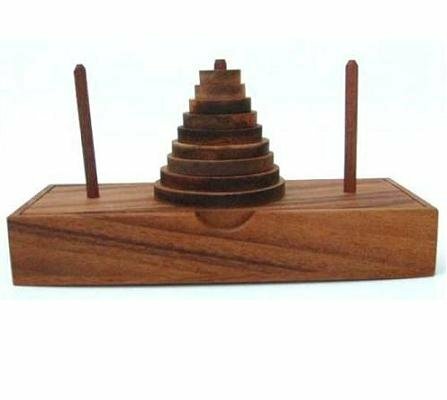 This beautiful pyramid 3D wooden brain teaser puzzle crafted to 5 pieces and a square base. 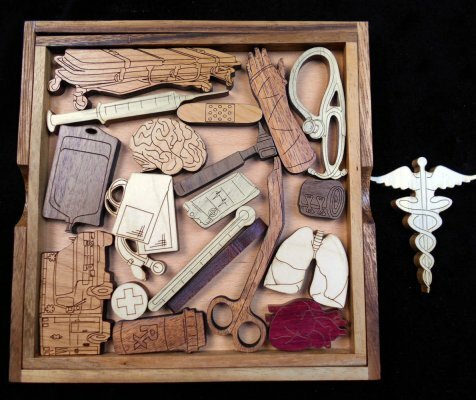 Try to build the pyramid using all the parts. 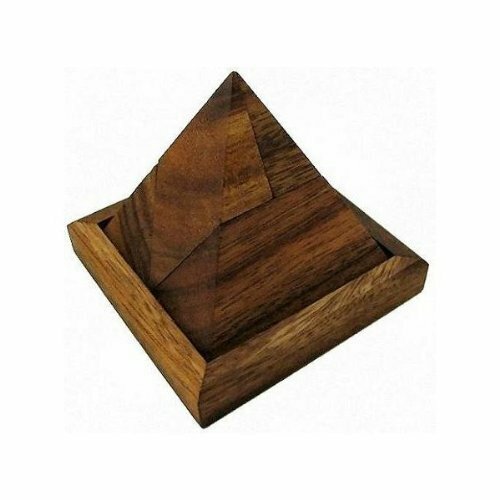 The Triangle Pyramid is perfect for displaying on your desk at work or on a table or shelf in your home. 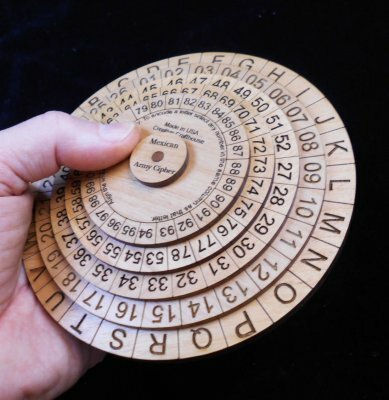 Some of the oldest poly form wooden puzzles first formed as chessboards. 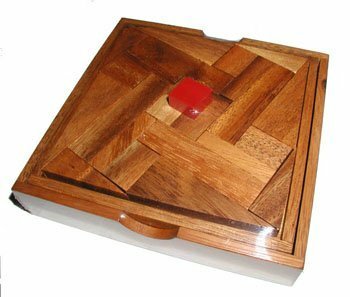 The Pentominoes contain 12 pieces; each consisting of five squares joined edge to edge forming different shapes. 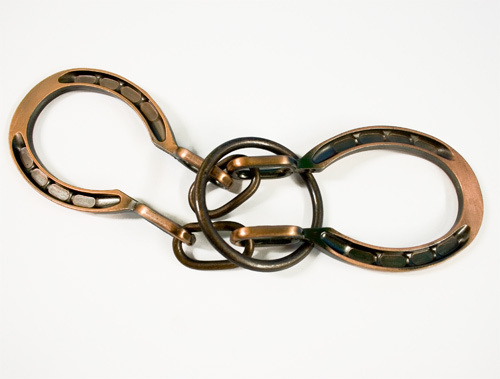 You may find the shapes of the alphabet letters:I,L,P,T,U,V,W,,Y,Z. the F looks like it had an accident and N takes some imagination. 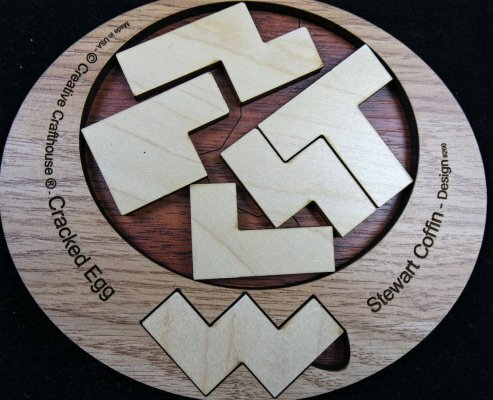 Can you place all 6 pieces into the egg shaped opening? 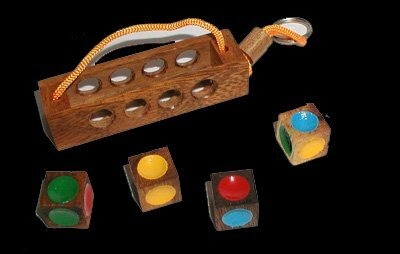 Shocking difficult and that’s no yoke! (sorry). 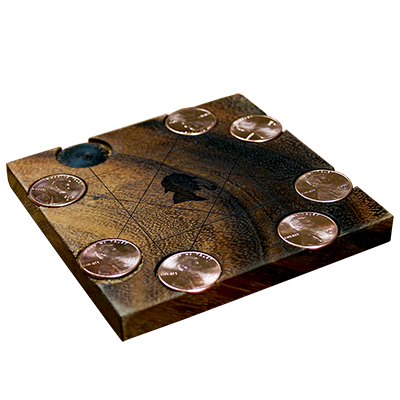 Maple pieces are in the floorboard frame measuring 6 x 5”. 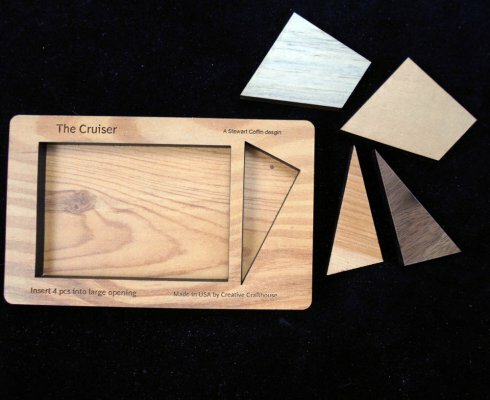 Frame and pieces are laser cut to assure only the one known solution. 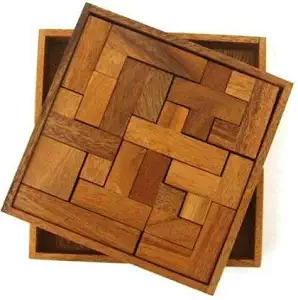 This is great and well known color combination brain teaser puzzle. 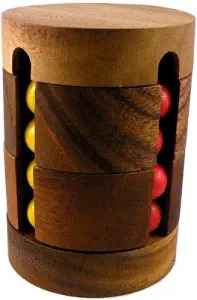 Arrange the cubes in a line, so that all 4 colors (red, black, yellow, green) appear simultaneously on all four sides. 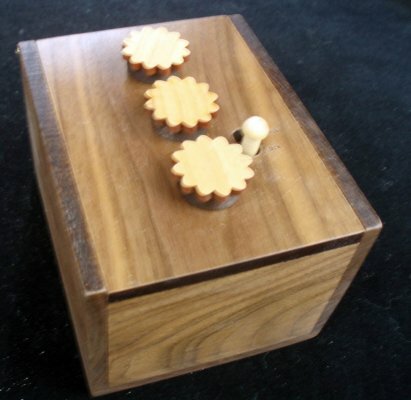 Each side will have a Red, Yellow, Green and Blue Dot showing. 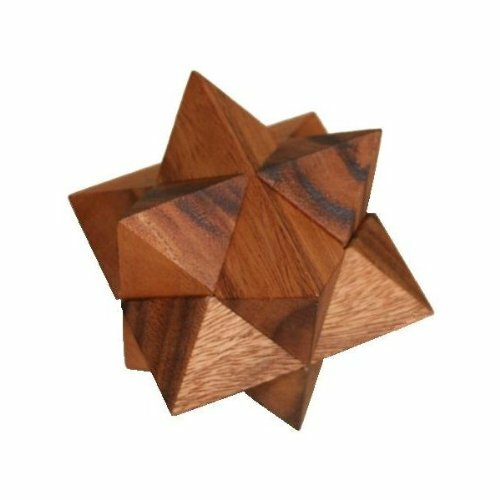 This star-like puzzle is a cluster of 6 wooden blocks. 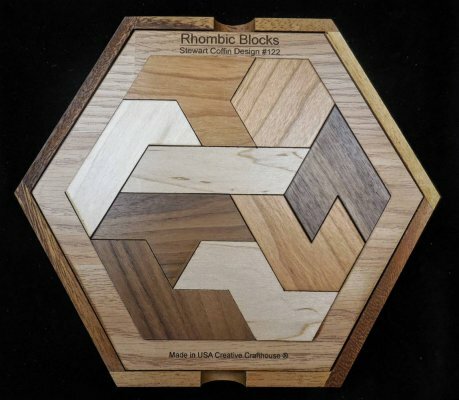 This brain teaser is made by careful carving of two of the surfaces of each block, so that the individual pieces can interlock. 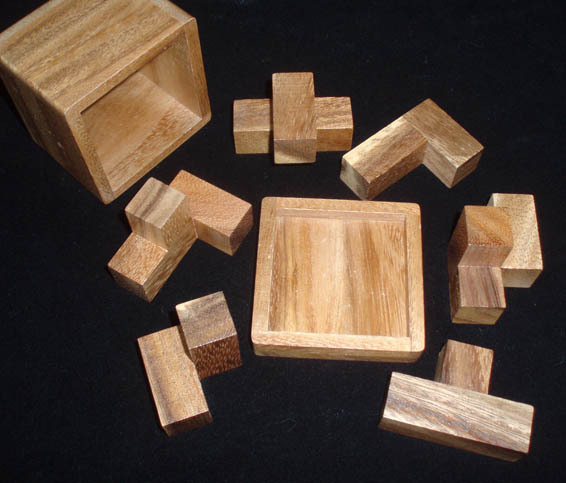 Even if you know the shape of the blocks, you will find separating them or reassembling the cluster, a very puzzling problem to tackle. 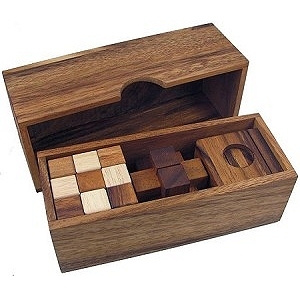 This great puzzle set is a perfect gift that includes 5 of our most popular puzzles! 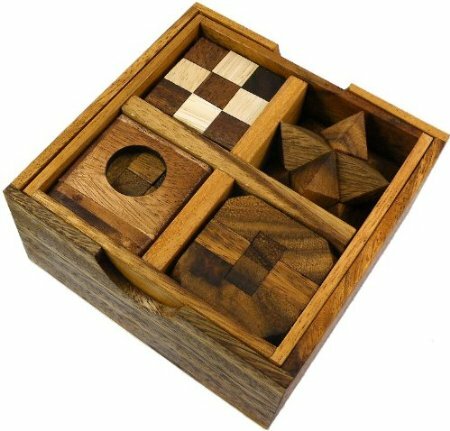 Approximate Dimensions (with craft box): 5¼" x 5¼" x 3"
This puzzles has been called by many different names, such as '7 Tricky Pieces', '7 Clever Pieces', 'Chinese Puzzle' and many more, but the most common is 'Tangram'. 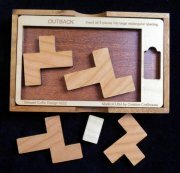 This great puzzle set is a perfect gift that includes 3 of our most popular puzzles! 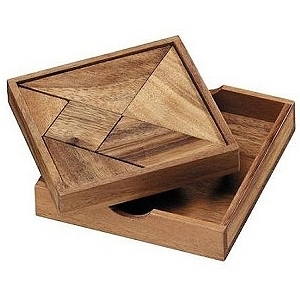 All three puzzles are stored in a fancy, high quality, handcrafted wooden box that comes with a matching lid. 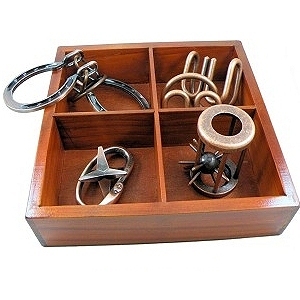 Approximate Dimensions (with craft box): 8" x 3" x 3"
This great puzzle set is a perfect gift that includes 4 of our most popular metal cast puzzles! 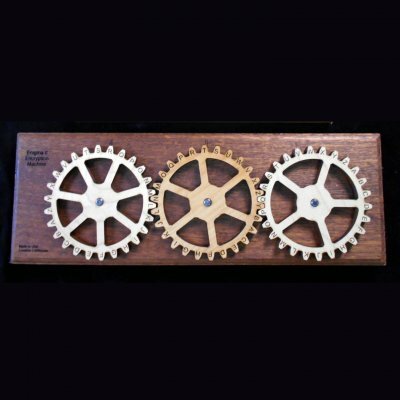 All four puzzles are stored in a fancy, high quality, handcrafted wooden box and then placed inside a gift box with PVC window. 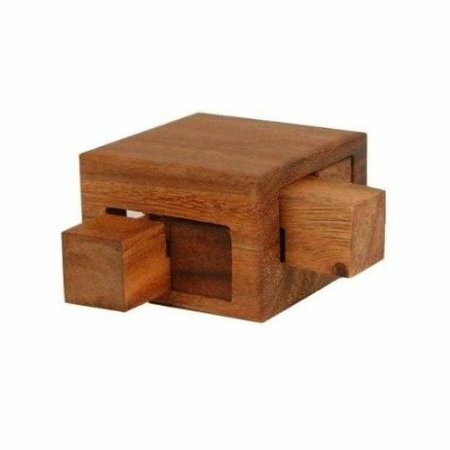 Approximate Dimensions (with craft box): 8" x 8" x 2"
This is a very challenging and appealing wooden brain teaser puzzle. Getting the 4 drawers out of the box requires a series of "sliding moves." For some it seems like impossible to get this one apart, but this is only half of the battle.